Seeds for the destruction of a unified Israel silently germinated. Their roots, tiny fibers really, spread throughout a polluted soil of discontent even before the death of King Solomon. While his governing policies projected success for his so-called “Golden Age,” reality for most was a life of hardship, poverty, and slavery. The state faced a chronic financial dilemma: costs outran income. His massive building projects, his army, and the lavish expenditures within his bureaucracy resulted in a runaway national budget, compelling him to take drastic actions. The once wise king now imposed oppressive taxes, introduced forced labor, and increased frustrations and privation. Noxious seedlings prepared for full-bloom revolt. Independence among the tribes of Israel languished. 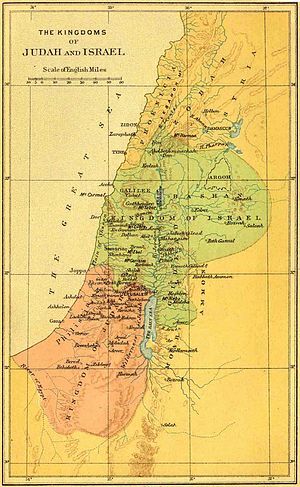 According to John Bright, in his book, A History of Israel (1972), “tribesmen who had once known no central authority and no political obligation save to rally in times of danger (which could itself be compelled, if at all, only by religious sanctions), were now organized in government districts, liable to heavy taxes and conscription for military service [and manual labor]. The tribal system was broken; the effective basis of social obligation was no longer Yahweh’s covenant, but the state” (page 219). An influx of foreign laborers like the Canaanites changed the national dynamics on many fronts—especially with regard to worship. Solomon did not help matters as he took 700 wives and 300 concubines, and welcomed paganism into his kingdom. I Kings 11 contains the record of his shameful actions—going after the heathen gods Ashtoreth, Milcom, and Chemosh. This would prove to be the undoing of Israel and eventually Judah. Only Solomon’s strong hand held the monarchy together. The northern ten tribes’ alienation grew, along with their determination to be free of oppressive control. By the time of his death, the internal pressures for independence and the pulls toward idolatry were so extreme that the kingdom split in two—the northern ten tribes (Israel) under the leadership of the arrogant Jeroboam, and Judah (the tribes of Judah and Benjamin), led by Solomon’s son, Rehoboam. Judah held exclusively to the worship of YHWH, the God of Israel, while the ten tribes worshiped not only YHWH, but welcomed, in the spirit of inclusiveness, deities from pagan cults, particularly Baal. This divide would be a source of contention and strife for years to come. Now the stage is set for the story of Jezebel. Hello, I want to subscribe for this weblog to get most recent updates, so where can i do it please assist. Enjoy your blog so much! Thanks for all the research you have both done. Thanks so much.Glad you dropped by! Are you sure this is Ancient Israel we are reading about? Sounds just like the current situation in the United States. Our demise can’t be far away! It certainly gives one pause, doesn’t it. Thanks for stopping by!